Isnt Malala an exaggerated individual? Isn't Malalai a tool for the west? KARACHI, Oct 27: Six months after undergoing a series of operations, Mian Syed Wahid, 65, is recovering and is now able to sit properly. He was among the many people inside The Nation Secondary School that came under attack on March 30 this year. Situated in Ittehad Town, a prize distribution ceremony was under way in the school when one after the other three hand grenades were lobbed at the school by armed men, followed by shooting. While principal of the school Rasheed Ahmed died on his way to hospital, chief guest Wahid, who got hit by a bullet near his kidney, underwent two operations and a surgery and survived. Besides the principal, a grade four student, 10-year-old Tahira Noor, also succumbed to her injuries. “Twelve people were injured in the attack,” said Mohammad Ali, an eyewitness. Six months later the school continues to run, with children from nearby neighbourhoods filling the classrooms. But the major difference this time around is that there are fewer girls in attendance. Sitting in a hunched position, in an open veranda of an Awami National Party (ANP) office in the area, Wahid speaks slowly about what happened. “Rasheed [the deceased principal] was receiving extortion chits from some criminals. I told him not to mess with them, but he didn’t listen and sought help from the authorities. A couple of days later this incident occurred,” he said. A close friend of Rasheed’s, Wahid was the only person who spoke against arranging a prize distribution ceremony. “I thought it was too risky considering the kind of threats Rasheed was receiving. But he insisted upon the ceremony arguing that schoolchildren looked forward to such events and he didn’t want to disappoint them,” he adds quietly. A predominantly Pakhtun locality, a huge chunk of the population hails from the Federally Administered Tribal Areas (Fata), with small pockets of Baloch and Urdu-speaking neighbourhoods, Ittehad Town is considered to be infested with militants. Initial reports that came after the attack on the school also suggested the same. But the school administration completely refuted it. Wahid, however, believes that, some “criminal elements” might be using the name of militants to extort money, adding that militants did have a presence in Ittehad Town. “From what we know, there are two factions active in our part of the town: Mehsuds and Kandaharis. SSP-West Irfan Baloch repeated what Wahid said, claiming that the ongoing operation in the city had “somewhat weakened their presence”. He however refused to comment further on the attack or the arrests made afterwards, adding that he had recently joined service and was not updated on the matter. The locality had its celebrity moment, last year, when teen education activist Malala Yousafzai, visited in March. With child-like happiness, Wahid narrates the story of Malala’s visit. Wahid’s older son, who is on crutches after an accident last year, emailed Malala congratulating her on winning a national award, adding that: “I would have congratulated you personally, but I’m on crutches.” To which Malala replied, “But I’m not.” A few days later she visited Ittehad Town with her father. Its probably just Mossad scaring the parents to give fake interviews. I bet these people don't even have children. Have they provided DNA evidence to prove they have children? Have they electronicly tagged their alleged children and had there whereabouts verified by an independent patriotic organisation? Even if they have provided DNA evidence it can't be used in court. It can be faked. parents generally tend NOT to send their kids to school when there are bullets flying around . To which Malala replied, “But I’m not.” A few days later she visited Ittehad Town with her father. ^^ she and her handlers will be exposed . her father basically sold her self to the highest bidder. When Malala Yousafzai was shot in the head by Taliban gunmen simply because she wanted to gain an education it sent shockwaves around the world. The truth is that there are hundreds and thousands of other Malala's. They come from Iraq, Afghanistan, Pakistan and other places in the world. Many are victims of the West, but we conveniently forget about those as Western journalists and politicians fall over themselves to appease their white-middle class guilt also known as the white man's burden. The Western saviour complex has hijacked Malala's message. The West has killed more girls than the Taliban have. The West has denied more girls an education via their missiles than the Taliban has by their bullets. The West has done more against education around the world than extremists could ever dream of. So, please, spare us the self-righteous and self-congratulatory message that is nothing more than propaganda that tells us that the West drops bombs to save girls like Malala. Why are we giving this girl so much attention? Forget this girl, there are so many more important things to worry about than running after this girl. NEW YORK: There was a flamboyant pop star. A legendary singer. A TV star, some supermodels, and one of the world's most powerful philanthropists. Even a former secretary of state who may soon be running for president. But of all the prominent women who appeared onstage Monday night at the Glamour Women of the Year awards, no one received more acclaim and adoration than a teenager whom no one had heard of little more than a year ago - 16-year-old Pakistani education activist Malala Yousafzai. The evening's Lifetime Achievement Award went to Barbra Streisand, who told the audience that she had been lucky enough to be born with a good singing voice. "That voice ultimately allowed me to speak out and have my opinions heard," said Streisand, 71, who proceeded to forcefully air many of them - including her choice for the next president. "There's never been a woman president," Streisand said, "but I hope that will change very soon - hint, hint! And we really need her now." She was referring, of course, to Hillary Rodham Clinton, who surprised the crowd by appearing to present a first-time award - Couple of the Year - to former Congresswoman Gabrielle Giffords and her husband, retired astronaut Mark Kelly. "I have lived my life so as not to let that day define myself - or my students," said Roig-DeBellis, who had much of the audience in tears. She was accompanied by a group of parents whose children she had saved. "Never be afraid to speak your mind," the pop singer told the activist - who is famous for doing just that. "I can't wait until my fans hear your story," she added. In a life full of despair and gloom, the youth needs inspiration and encouragement. Malala is their hope, and she is leading by example. What have you done or the Taliban done, Vs what is Malala doing - does that answer your question? Edited by Felicius, 13 November 2013 - 08:16 AM. This girl is being used by the Anti-Pakistan actors. Everybody knows Islam is for women's education. I thought everybody was saying that this girl is being used by the west as tool. Didn't people agree to that? Tha's why I said forget this girl. there is much more important things to worry about than running after this girl. My opinion this girl should be concerned with school and family, than going to press conferences. What have I done? I have done whatever I can do. You mean the Malala girl? she merely a pawn in the big game. After a few years she will lose her relevance and people will move on. ^ Again: What have you done Vs what Malala is doing? In context with your question why is she being given so much importance. Not in the least, who are the everybody? Alright I guess there was lamdacore, I suppose. But seriously, I am not fan of this girl. Seriously she is was being used as tool by some people. Anyways...like I said in 4 months people will forget her, and life will go back to the usual boring cumbersome stuff. You are not getting me at all. Malala has done more than anyone of us here, for the plight of girl's education. Islam says this and that is irrelevant when people like you and me sit comfortably in our homes while in reality the girls are being targeted, along with female teachers. The entire world is giving Malala importance. Agreed women's education is a priority. Didn't we have a member Skull-Buster saying that many of the universities in Pakistan are women majority now. So what's the so called fuss-puff? Like I said before, we just see the black and the white. We have people who have gone to the extent of calling Malala's shooting pure drama. I mean have some heart please. She was a kid when she was shot at and we should put ourselves in her boots for a while and envisage how all this would have felt. I really feel for this girl that she had to undergo all this. I feel the pain, the trauma and the everlasting psychological effects. However the pain I feel for her is still lesser than what I feel for the poor youth of Khi who go to their schools not knowing if they would return. I was at a conference once and one of the students explained how it felt when drones flew and how the people couldnt sleep at night. All these people are our own. What they are going through is not lesser than what Malala undeewent, if not more. I have read about Malala's efforts but apart from blogging and public appearances, I dont find anything else and I dont mind it for she is still a kid in her teens. Seeing my friends who volunteer for immunization campaigns and seeing how they put their lives in danger, I believe they deserve more appreciation. Malala's efforts should at best earn her admission at ivy league. But this is what we call luck- to be at the right place, at the right time. If she is being honored, whats the big deal in digesting it! Malala has been the inspiration and encouragement, not a saviour or a messiah. People who were mentally affected by the harsh TTP rule, developed herd mentality , that we shall not sell CDs (burning small businesses) or we may not celebrate weddings (beheading anyone who danced), and now girls should not attend school. She alone, at a very precarious age, challenged the Taliban's writ. When adults who owned weapons were submitting to the terrorists demands, she was writing against them and refused to back down - kept on attending the school. She alone led by example, when all of you were saying make a peace deal with them so that they can enforce their unjustified butchery even further. Because of her actions, other girls and their parents have begun to defy the Taliban's writ again. That resulted in Taliban increasing their terrorist activities against the people there; more the reason to go hard and harsh against the TTP. Edited by Felicius, 14 November 2013 - 07:57 AM. The huff and puff are the few members here. Majority of every continent on this planet are supporting Malala. I can count perhaps the 4 or 5 members against her here on my fingers. You won't know where to begin if you were to count her supporters. I honestly fail to understand why people have such a grudge against her. So what if other countries are able to manipulate her scenario to make themselves appear better and to make you appear bad. Look at the very basics, she was shot in Pakistan, she was treated in Britain. Malala on her own may have been a perfect example of girl displaying leadership qualities to tackling the Taliban. Unfortunately, the way the West is handling this simply raises a lot of eyebrows i.e. there is more to this than meets the eye. The point is that there are many other boys and girls who have been fighting for their rights in many parts of the country defying some sort of oppressing power but no one ever cared to even address that in even the local media. Then here comes Malala with one agenda (no matter how good it may be) and she Waltz off in the West and is slapped all kinds of prizes that would only position her for future politics. This is why it looks so sinister and that is why one needs to be careful when falling for such traps as we have so often done in the past. Bro, do you not think it was in her kismet to survive? She happened to be writing for the BBC Urdu. The other girls were not. This is the fortunate contact that meant she was able to get treatment in the UK. How other people have treated her since and used her for political mileage, that's out of her control. Frankly we have a common interest, there are individuals who want to prevent women from getting education in Pakistan, limited as they might be, they are getting a very public profile. If the western world wants to highlight this as a problem in Pakistan, why not use that to our advantage and put pressure on the elements of society (like JI) who provide them silent support? The fact of the matter is, if this girl had been writing blogs for say Dawn, or the Nation or another Pakistani daily, and she was shot and killed, today all those looking for double agendas would be putting her on a mantel and labelling her shaheed, but she was writing for BBC Urdu, she survived, so the same section of society vilify her, for being fortunate enough to survive. There is a section of our society, small but vocal who'd rather a little girl was dead, rather than alive and being used to shine a light on a part of our society we're ashamed of. I guess the best thing that can happen is to let this whole thing unfold and as things move forward we will see what kind change will be spurred some 10-15 years down the line. It is a tragedy that innocence is so cleverly manipulated to achieve long term political goals. I think we need to differentiate along these lines where we can consider Malala to be an innocent child but the agencies manipulating such intelligence to use her in the long run are far from innocent. Yet, now that Malala is firmly in their grasp and she is to be an adult in a few years time....would we still consider her to be innocent?? That is why we need to see beyond the Malala veil and uncover the sinister plans and make sense of them and finally counter them. That is all I am trying to say. I think we over complicate things. Pakistani's seem to think that the western worlds interest in Malala is to create a secret agent to release into the political scenario when they need to control Pakistan. I think that is wrong. Firstly because I live in the UK and even illegal immigrants can get medical care. Secondly if there was any political mileage to be gained it was from the short term, ie "yes the war in Afghanistan is unpopular, but look at the kind of victims we are trying to protect" etc. Ask yourself this, what part of Pakistan does the western world not have sufficient influence over? - Our politics is dynastic. All Pakistani politicians have their children studying in the West, aspiring to western lifestyles. - Our current politicians are entirely under the influence of Western diplomats and governments. Heck even local players like UAE, Iran and KSA hold sway. - Our economy is controlled by the IMF and the world bank. Who needs Malala when you have Bilawal and Hamza? We have an entire political system born into this cesspit of haram, fed on it, raised on it, who worship it and who will be elevated to the top in due time by ourselves. Malala Yousafzai, who won the Nobel Peace Prize on Friday, is hailed around the world as a champion of women’s rights who stood up bravely against the Taliban to defend her beliefs. But in Pakistan, many view her with suspicion as an outcast or even as a Western creation aimed at damaging the country’s image abroad. Malala, now aged 17, became globally known in 2012 when Taliban gunmen almost killed her for her passionate advocacy of women’s right to education. She has since become a symbol of defiance in the fight against militants operating in Pashtun tribal areas in northwest Pakistan — a region where women are expected to keep their opinions to themselves and stay at home. “The terrorists thought that they would change our aims and stop our ambitions but nothing changed in my life except this: Weakness, fear and hopelessness died. Strength, power and courage was born,” she told the United Nations last year. “I do not even hate the Talib who shot me. Even if there is a gun in my hand and he stands in front of me. I would not shoot him,” she said in a speech which captivated the world. Malala has also won the European Union’s human rights award and was one of the favourites to win the Nobel Prize last year. 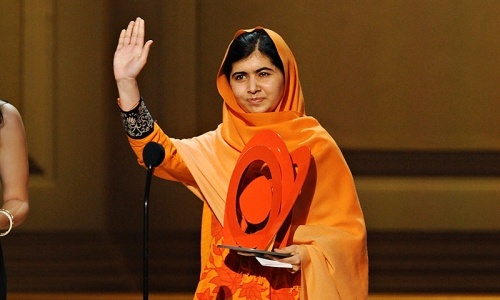 Congratulations Malala! Finally some positive news about Pakistan. Last time we won the prize was in 1979 by Abdus Salam, and the way Pakistanis treated that man regardless of his religious background is SHAMEFUL. There are always going to be haters and jealous people against Malala with their BS conspiracy theories. No one cares, they can go cry themselves to sleep. FACT: Malala is portraying Pakistan and Islam in a positive light. FACT: She's bringing attention to a real problem in Pakistan. Some BS "my grandaddy says we're fine" nonsense doesn't cut it. FACT: Youngest winner in the history of the Nobel Prize!!! Malala def is a courageous individual and she has very good leadership qualities. She deserves every bit the honours that have come her way. I wish Pakistanis could excel in the field of natural sciences and grab the nobel prize. The nobel prize for peace has hardly any substance involved and is more a political gimmicl.. If someone like Edhi from Pakistan does not deserve it, I wonder who else does! I dont deny that she underwent hard times, but just because that something happened accidently, I am not inclined to believe that her advocacy has really made any tangible impact (other than getting some government schools named to honor her). This is like developing a sense of admiration for people like Bhutto and Benazir just because they were hanged or were gunned down. Nonetheless, lets embrace her for whatever little she has done. I believe the Nobel for Malala is an award for the cause she upholds and not to the individual alone. That way the award is for all the Asian girls suffering oppression and denial of basic rights. That oppression does exist across the border in India also, though it may not appear as violent. There are millions of girls suffering discrimination in silence and the award is for them also. Actually the Nobel prize for peace is to be given for some contribution towards establishing peace. OPCW received it last year, you can contest the fact whether or not it deserved it, but yes, OPCW was an eligible nominee. I dont who on earth found people like Malala, Dr. Younas, Tawakkul Karman and few others as eligible for this award? The award is not meant for education, micro-financing etc. And if at all the committee finds all this worth the nobel prize for peace, I dont know why people like Edhi have not ended up receiving it. Btw, there are number of people in Pakistan advocating female literacy, Musharraf Zaidi is one of them. I have yet to figure out what substantial things Malala has done. Organization for Prohibition ofChemical Weapons (that was entrusted with the task of destroying Syria's chemical weapons last year). Mr. Eidi has a beard tgats why... he doesnt fit into the storyline all muslims and islam is evil.... thats y the neo-liberal ngo will always ignore him. #78 For the Glory of Pakistan. I saw some people stating that she is supporting education how can she go wrong, but no one takes in to consideration that the syllabus students are studying in schools is transforming kids more towards western agenda then making them better person or better Muslim. Until we fix our syllabus, we will be harming the society more, because more of these kids will drift away from Islam and the only thing in there mind will be to how to make money. Did you go through the same redundant education system? You must have done if you are advocating illiteracy. Keeping children, not girls alone, out of the school system cannot supported. If the syllabus is seen to be at fault, it should be finetuned. But the lessons overall should make a student capable of living in a world that is becoming more and more intertwined and mutually dependent. The world is indeed shrinking. Read somewhere Pakistan has the most number of unschooled children in the world.